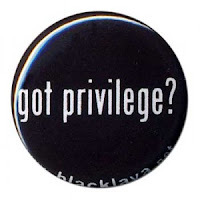 I've been thinking a lot about privilege lately. See, I'm a very privileged person. Oh, I don't mean I'm wealthy or anything; far from it, but the simple fact is that I have advantages that many people simply do not have, unearned advantages that I was simply born with. I'm a straight, white, naturally-thin male who was raised Christian and who, while not wealthy, has never been exactly poor. There are doubtlessly many other privileges I have that I don't have space to list, or that I don't even know I have. Because the thing about having privilege is that... well, it's hard to see, when you have it. There are, of course, many things that can go wrong when one has privilege, especially when one can't see it. I had the best of intentions Thursday night, I really did. I had the evening to myself, no chores or work that required my immediate attention, and I was going to make the best of it. I was going to update this blog, or finally organize my backlog of photos, or revive my essentially-defunct photo website. I was going to be productive, and not just spend another evening playing around on the internet. * I really was. But I got home from work and found a telescope on my porch. Now, it wasn't precisely a surprise, since I had ordered it myself back in August and have been waiting for it anxiously ever since, just a little disappointed every day I came home and there was not a package on my porch. 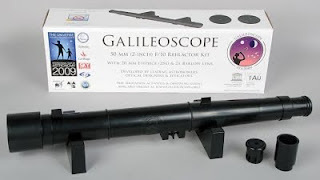 It's a Galileoscope, developed as a cornerstone of the International Year of Astronomy (which, as I'm sure you already know, is/was 2009) and specifically designed to be a high-quality but affordable telescope, with an emphasis on education (discounts for bulk orders, classroom activities, etc.) Assembly is purposefully required, both to save on cost and as a learning experience (while the assembly is pretty easy, the included directions are incredibly terrible. The expanded directions online are highly recommended.) It can be used in three different configurations: 25x, 50x, and 17x, the last of which closely mimics the view through Galileo's original telescope. So, instead of doing something artistically productive, I built myself a telescope (which took longer than it should have, because of the aforementioned terrible instructions) and within minutes was in my backyard, looking at Jupiter, Callisto, Io, and Ganymede, all clearly visible at 25x, even in the middle of light-polluted Baltimore. Once Annie got home, we went up on the roof and looked at the waning gibbous moon and the Pleiades. I can't wait to show her Jupiter and it's moons, which had set by that point, and Saturn, which doesn't rise until about 3 AM right now, and whatever else we can see in the glare of the city. But, really, this post isn't about my shiny new toy. ** It's about why I was so excited, why I was out late in the cold on my front porch to see if I could find the Orion Nebula (I couldn't). Astronomy was the first science that I remember really, truly loving, and it remains my favorite of the sciences. I majored in physics, spent five years doing school programs on a variety of scientific topics including biology, paleontology chemistry, and currently -- exclusively and inexplicably -- do classroom programs on embryology, but it was the astronomy programs in my college's planetarium and in the portable Starlab during those five years that I think I liked best. See, astronomy, in many ways, is a gateway science. I can't tell you how many science people (researchers, educators, or simply dedicated geeks), regardless of their field, have told me about simply looking up at the stars when they were kids and wondering. It sparked something in them, a humbling awareness, a questioning, a yearning of some sort, though obviously they didn't recognize it as such at the time. They, and I, simply looked up and went "Wow." Many of them went on to apply those same feelings to other areas, whether it's stem cell research, organic chemistry, nuclear physics or, yes, astronomy. But astronomy opened so many more doors than that. It's no exaggeration to say that the human race itself was introduced to science via astronomy. Many, many thousands of years before we could view or measure much of anything else scientifically, we could do it to the heavens. The sky is enormous (many of us forget, since we usually focus on what's right in front of us), and mysterious. Few things are so universally spread out through ancient myths across the globe as the stars, sun, and moon are. They were gods, spirits, demons, heroes, life-givers. They were omens, portents, signs, symbols. They were patterns, stories, histories. And they were predictable. These incredibly important things that everyone could see, things that supposedly could determine our future, or give us a clue as to the workings of the gods, could be understood. From these superstitions came the very first systematic scientific observations and recordings. Those ancient astronomers/astrologers (for at the time, there was little distinction) viewed and charted when the sun rose and set, how it rose higher in the sky during summer and lower in winter, the phases of the moon and when it rose and set, how they could interact to cause solar and lunar eclipses, the positions of the stars relative to the sun throughout the year, what constellations were visible when, the movements of each of the planets, and so many, many other things that could be seen simply by looking up and paying attention. So for millennia, these observations were recorded, and all the while we wondered what, exactly these lights in the sky actually were. How far away are they? What are they made of? Why do they move as they do? How do they relate to the Earth? Do they affect us? 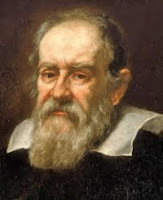 Four hundred years ago, in 1609, an Italian scientist named Galileo Galilei made significant improvements to a new Dutch invention for seeing across long distances that would later be called the telescope, and turned it skyward. The observations he made through those simple, early telescopes and the theories proposed based on those observations are easily among the most important in the history of science, and inarguably helped kick-start the entire field of modern science. Even more than that: he forever changed how the entire human race views itself, and its place in the universe. It had been assumed that all of the heavenly bodies were perfect spheres manufactured by God hisownself, but Galileo saw rough mountains on the Moon. 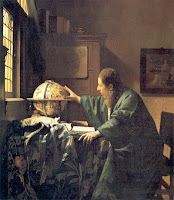 Even the supposedly all-perfect Sun turned out, under Galileo's watchful eye, to have the occasional spot on it. Everyone knew as well that everything in the sky rotated directly around the Earth, but Galileo saw four moons going around Jupiter. Ah, but the major things, like the planets themselves, they still went around the Earth! But Galileo saw that Venus had full phases, new, crescent, half, gibbous, full, and back again, while never going very far from the Sun. The Morning Star, the brightest object in the sky after the Sun and Moon, was orbiting the Sun, not us. We were not the center of the universe. This was, to put it lightly, a humbling discovery, and affected every single aspect of our lives, far beyond science. And now, four hundred years later, a dozen human beings have set foot on the Moon. We have sent probes to land on and orbit around other planets, to leave the solar system itself and report back to us. We now know that there are hundreds of billions of galaxies, untold numbers of stars (septillions? ), black holes, quasars, pulsars, nebulae, and more. Over just the last decade and a half, we have discovered hundreds of planets going around other stars, and it's only a matter of time before our observations are keen enough to find ones that are Earth-like. We are learning more and more every single day about the entirety of the universe, everything that is, about the nearly 14-billion-year history that brought us here and about what might happen next. And when I go out amidst the glare of city lights and look through my cheap, plastic telescope to see shadows on the Moon, and the Galilean satellites of Jupiter, and the rings of Saturn, to see them, to really see them, not as a picture, not as a video or computer animation, but to really SEE them, right there before my eyes just as Galileo did, I feel a sense of awe at being part of such an unimaginably vast cosmos, and feel connected to all those who went before me, looking up and wondering and thinking, turning the world around and upside-down, even back to the dawn of civilization, and forward to all those who will come after, and look up at the stars, and wonder. And that's why this post is late. *Likely would have ended up spending it playing around on the internet. **But, seriously, I've got a shiny new toy. This is an attempt to teach myself to be better with words, to be able to express myself instead of forever doubting my own voice. Few will likely be listening to this, but to fix that I need to learn how to speak.